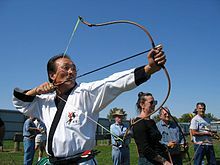 ↑ The noun "toxophilite"، meaning "a lover or devotee of archery, an archer"، is derived from Toxophilus by Roger Ascham —"imaginary proper name invented by Ascham, and hence title of his book (1545)، intended to mean 'lover of the bow'۔" "toxophilite, n." Oxford English Dictionary۔ Second edition, 1989; online version نومبر 2010. <http://www.oed.com:80/Entry/204131>; accessed 10 مارچ 2011. Earlier version first published in New English Dictionary، 1913.